The aim of this article is to give a general overview of propeller shaft bracket design. The purpose of the propeller shaft bracket is to support the propeller shaft and the propeller. 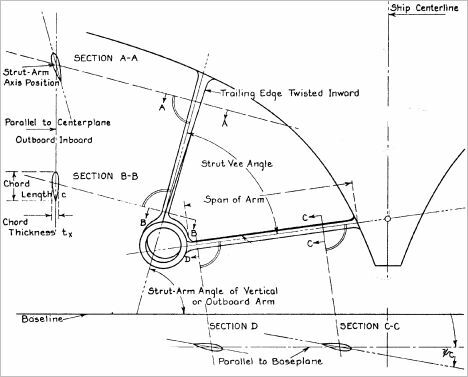 Section design and the number are determined by the shape of the hull, the length of the propeller shaft and the operational features of the vessel. In order to satisfactorily carry out its function as a support bracket it must have various structural and hydrodynamic attributes which involve considerable design difficulties. As an exposed structure it is a hull appendage subject to dynamic actions which generate stresses that are hard if not impossible to evaluate, both in normal functioning conditions and in conditions of extraordinary load (such as striking a floating object or stress due to propeller, bearing or shaft damage). It is therefore impossible to take precautions against all the difficulties and accidental events the bracket might come up against when the vessel is operational. The fundamental requisites of the bracket are: it must be tough enough to support the bearing under normal operational conditions up to the maximum power developable by the engine(s). These functioning conditions involve the load caused by unbalanced centrifugal force and hydrodynamic thrust, the forces of inertia due to the movements of the vessel in a choppy sea and the action of gravity on the shaft-propeller assembly. Since the stresses generated will be of an alternated type, they must be contained well below the limits of material fatigue; it must be proportioned to tolerate the stresses generated in the extreme situations of loss of a propeller blade or seizing of the bracket bearing; it must be rigid enough to obviate vibrations and absorb any vibrations caused by the action of the shaft-propeller assembly; there must be a safety margin such as to permit the bracket to resist extraordinary actions such as battering caused by the propeller emerging under way in stormy seas or by touching rocks or the sea bottom; it must have hydrodynamic characteristics such as to ensure that resistance and interference with regard to the flow of water to the propeller are kept to a minimum. A main cause of vibrations in a vessel is the variation of flow on the airscrew disk, so the bracket must not aggravate these conditions; it must, as much as possible, be designed and built to avoid the destructive effects of erosion due to cavitation. single beam or fin (Figure 3). On large vessels the first two types have been widely used as main brackets while the fin bracket, much employed on small displacement craft, has found only limited use. The first distinguishing feature, and the most evident, is that merchant vessels normally have reinforcement type brackets while fast vessels have one of the other two kinds. Therefore the choice must be made first of all on the basis of the different characteristics of the vessels in relation to their envisaged use. The action of counter-propeller flow produced by a reinforcement or fin bracket is very important. 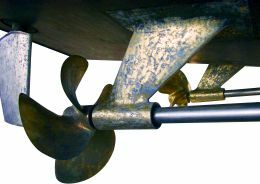 In merchant ships whose stern shapes have a very full keel and reinforcement type brackets, good results are obtained if the forms of the stern are designed in such a way as to create this counter-propeller effect with the surface of the hull and the bracket. The flow generated by a symmetrical stern has certain zones of stagnant flow and others in which the flow lines are opposed, so not only is the propeller working in a non-uniform flow but is also likely to transmit to its shaft and bearings the related intermittent hydrodynamic forces which cause considerable and dangerous vibrating of the hull. Adopting an asymmetrical stern shape, designed in such a way that the upper and lower immersed parts of the stern are set, with regard to the shaft line, in a direction opposite to the rotation of the screw, the water flow will be forced to move towards the part of the propeller disk most lacking in lines. In practice what is obtained is an actual warping of the flow, which is opposed to the movement of the propeller, and therefore an increase in propulsive yield. 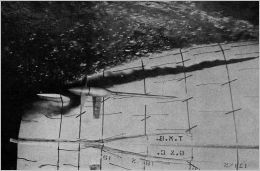 Figure 4 shows the transversal sections of a ship's stern where this counter-propeller effect has been envisaged, obtained through suitable design of the surface of the hull and the reinforcement. A fin bracket, though larger than a frame type and therefore with greater appendage resistance, is able to produce a counter- propeller effect on flow and has led to decidedly high propulsive yields, such as to cancel out its greater resistance and to contribute considerable power savings - up to 8% - with regard to the propeller boss. Contrarily, frame type brackets, given their very slender appendage form, bring no benefits to counter-propeller effect and the best position is around zero degrees. By shifting the position slightly from this value (4/5 degrees) increases in power up to 4% may be produced. This different behaviour is due to cavitation phenomena which arise and alter water flow towards the propeller. In relation to manoeuvrability, reinforcement type prop shaft brackets are disadvantageous if the vessel's speed is relatively high, which is to say if it has high power with regard to length. Moreover, the presence of very pronounced reinforcements may, due to the great powers involved, produce a high concentration of wake in the flow towards the propeller, causing cavitation phenomena in the blades. Reinforcement type brackets are also efficient in absorbing roll, meaning that they can reduce the size of anti-roll bilge keels. 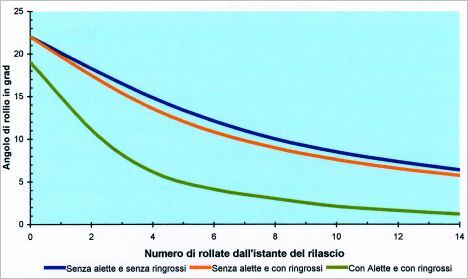 Figure 5 shows that absorption of roll with reinforcement type brackets on a twin-screw ship is only slightly improved with respect to the same ship without them, and that moreover the absorption effect of the anti-roll bilge keels is far greater than that of the brackets. This type of bracket however brings other advantages of a practical nature that should not be neglected. In fact they may permit access from within the vessel to the shaft lines along almost their whole length and also protect the shaft line and bearings from foreign bodies in the water. The beam or beams of the bracket are therefore the structural element that must satisfy the various requisites. This leads to the need to create a structure that is, in substance, suitably tough, sufficiently rigid and with optimal hydrodynamic characteristics. Determination of the best form of the beam section and the basic characteristic of the stress represent the solution to the design problem. The loads bearing on bracket structure are of a dynamic and of a static nature. The latter are so small as to have little effect on the most suitable determination of stress characteristics and therefore of safety load. vibrations determined by propeller functioning. In the bracket beam or beams these actions generate a normal stress, a longitudinal and transversal bending moment and a torque which is more or less preponderant depending on the type of structure. 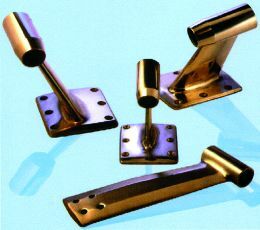 Frame type brackets prove to be more efficient than fin brackets. The former have a uniform section all along their length whereas the latter have variable sections along their length. We have seen that in frame brackets we can obtain suitable toughness and rigidity even with beams that appear considerably thin and slight. But these thin forms may involve cavitation, especially when set at an angle with regard to local flow direction. A set-up with the profile presented to the current with zero angle of incidence is nigh impossible. In fact local flow changes with the variation of direction of manoeuvre, with the vessel's course in relation to wave movement, with the movement of the vessel in a choppy sea, with trim and displacement. The effect of an angle of incidence is determining with regard to cavitation, since the immersion of the upper part of a bracket beam is small and the corresponding cavitation index very low, especially at high speeds. 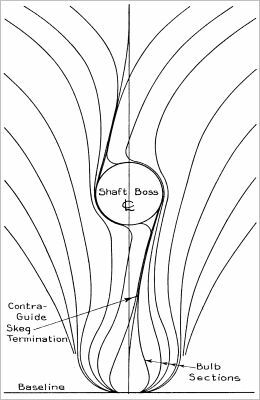 The presence of cavitation and the separation of flow may cause intermittent whirlpools and lateral vibrations of the beams, erosion of the surface of the beams and, most serious of all, considerable disturbances to the flow converging on the screw. Much care must be taken to obtain accurate alignment of the bracket beams with the flow lines at design speed. This alignment however cannot eliminate the inevitable angle of incidence due to the motions of the vessel. Practical design must acknowledge the existence of these angles of incidence and the resulting form of the bracket must be such as to minimize the deleterious effects mentioned above. The most appropriate angle to keep in mind during design may be experimentally estimated through tank tests (Figure 6) during the self-propulsion trial in which the flow around the model's stern while the propeller develops its normal thrust is established, taking into account the influence of the speed induced in the water crossing the prop disk. In general, the angle of incidence does not vary more than one degree at all operational speeds in the rectilinear progress of the vessel, and the vessel moves with this motion for roughly 98% of its working life. The correlation between the angle of incidence of the bracket beams and the possibility of cavitation is clearly shown in the curves of Figure 7 in which the dotted lines represent pressure distribution, the depression side of the profile, along a profile set at various angles of incidence with the direction of flow. If the peaks of negative pressure on the depression side of the bracket beams exceed a certain critical pressure, cavitation will begin. The dotted areas of the figure underline that cavitation may occur even with relatively low speed values and at normal angles of incidence. Thus, analysing the data of the diagram in Figure 7, it may be seen that cavitation can be avoided or diminished by reducing the angle of incidence. 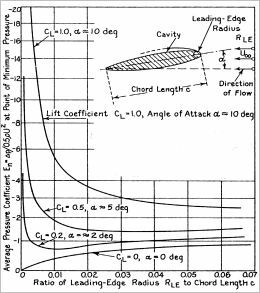 Moreover, from the progress of the curves of pressure distribution along the profile, and from the position of peak pressure, it may be seen that, angles of incidence being equal, cavitation can be avoided or reduced by intervening on the form of the section. On the basis of values taken from the theoretical distribution curves of pressure, the diagram in Figure 8 was drawn up in which the coefficients of pressure En, regarding each of the 58 different symmetrical two- dimensional profiles experimented with, are shown in function of the nose radius / string length ratio at various angles of incidence. The progress of the median value curves shown in Figure 8 underlines the characteristic influence of the nose form (forward edge) on the value of the peak of negative pressure regarding values of an angle of incidence that are other than zero. It is therefore necessary to avoid sharp nose forms and, indeed, by increasing the value of the angle one must adopt very large nose forms, which is to say a greater radius of the forward edge. Moreover, in the diagram mentioned above, one may identify the position along the string of the peak negative pressure value. particular action of the form of the section between nose and maximum thickness. 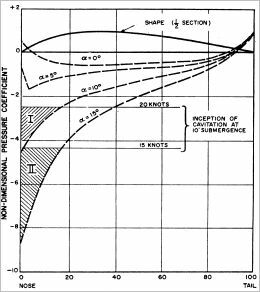 Choice of the appropriate form of beam section was the subject of a long and accurate study based, as mentioned earlier, on structural and hydrodynamic considerations. A study of this type, setting out from the results of many tests on hydrodynamic profiles (Figure 9) was carried out by Mandel. As may be seen from the foregoing, to design a good bracket one must use a beam section which minimises all the hydrodynamic forces acting thereon and the probability of cavitation damage, and which maximises the resistance module of the section on equal terms with weight unit. These requisites are compatible and may be achieved, in design of the section, by balancing great nose radii, section thickness and median position of maximum thickness. For fast vessels it is better to adopt the frame type bracket whose beams have a string/thickness ratio that may vary between 5 and 6. One thing to avoid is that the upper beam of a bracket be connected to the hull at a point above the free transom because this would undoubtedly form a cavity in the water on the free surface behind the bracket due to the low pressure there. 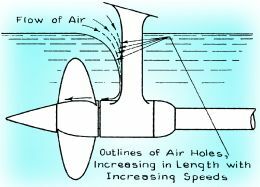 Separation of flow behind the rear edge would form a passage for air which would extend from the surface of the sea along the beams right to the propeller hub and the propeller itself, reducing its thrust and generating vibrations (Figure 10). Special care must be taken in structural connection of the bracket beams to the hull and to the hub. The structure of a hull supporting a beam of the bracket must be designed to absorb the entire stress of the beams. So special care taken with the structure of the part of the hull supporting the bracket and its own related structure should obviate the formation of vibrations that are often a feature of a vessel's stern area.